Lightweight backpacking requires individuals to think out-of-the-box and break from traditions likely taught for generations. For example, many "traditional" backpackers often carry emergency kits which may consist of an emergency tube tent or emergency blanket in addition to other items. 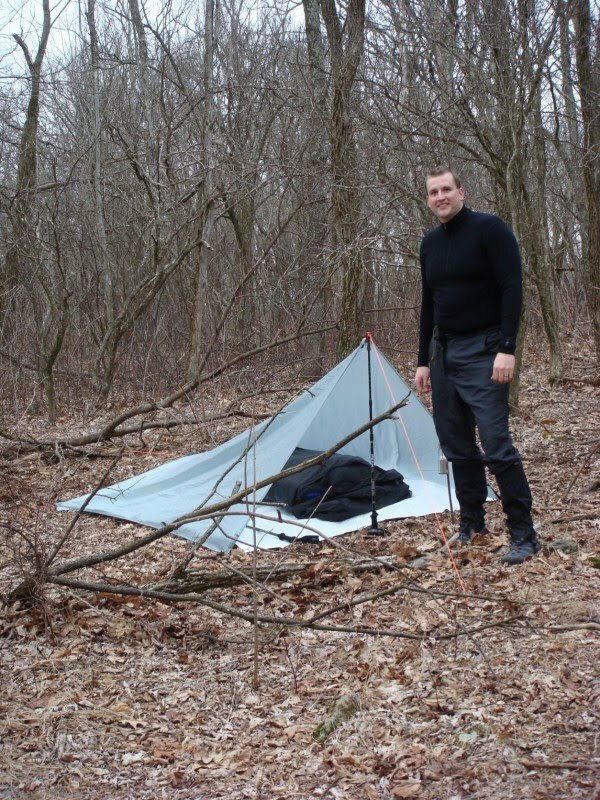 I too would love to have an emergency shelter or blanket if put in a survival situation with no other gear. But these items are more for people who are in an emergency situation without gear, not for those carrying a pack full of stuff already. In my opinion, quite a bit of what traditional backpackers carry with them are very redundant and arguably unnecessary. Part of going "lightweight" requires the exercise of common sense, which sadly, is a fad that went out of our landscape long ago. It means giving up redundant gear, not because it couldn't help in a bad situation, but because it is often terribly unnecessary even in an emergency. For me, there are many backpacking items I often think about quite deeply. I think moving towards a mini Swiss Army Classic knife likely was the something that required the most angst, and quite honestly, I'd still love to have a more robust knife with me because there is a side of me always thinking I'll be pressed into a serious survival or emergency situation despite the fact that my current gear would likely serve me just fine. Before going lightweight, I had carried a beautiful SOG knife which I still love despite the fact that it sits in my knife box along with several others which have become obsolete over the years. Oddly enough, I rarely use the mini knife I do carry and actually use the toothpick and scissor function more than the knife part. My change to a lightweight knife was one of many choices I needed to make which I thought was a practical move. Yet, some lightweight backpackers take a far more hardline than I do, quite literally bringing only the big three with them (shelter, sleep system, pack) and often that's it with few exceptions (cooking systems are a pot over an open fire, rain gear is often unnecessary in the summer, a healthy yell can replace a whistle, skilled folks can start a fire without matches, etc.). 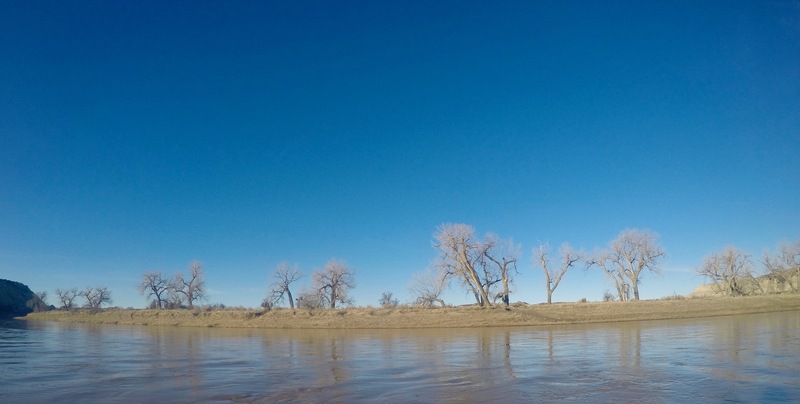 But this style doesn't sit well with my sensibilities and I think it is important for each lightweight backpacker to make decisions based on their own skills, gear, and relevant to the environments they will encounter. For example, one of the things I carry that I rarely see on any lightweight backpackers gear list is a very small mirror. Over the years, I have found it invaluable. It's great to look at for ticks on my backside, it's great to help pick a gnat out of my eye, it helps identify the seriousness of any wounds to my face (bee stings, fallen branches, etc. ), and probably of greatest importance to me, it works as a signal mirror which is tremendously tough to duplicate in the backcountry. As a solo backpacker, I often can't rely on someone else to help with many of the functions that this mirror handles. My personal thought about going "lightweight" is that it does NOT involve dumping every potentially useful item from your pack. Instead, it focuses on finding lighter and smaller solutions which are more reasonable and accomplish the same goal while otherwise cutting out redundant gear. So for me, the mirror remains in my pack, albeit small and light, but it remains. One item that I've thought a lot about recently was cordage because it can offer so many dymanic uses. The only cordage I carry is that which I use for my bear bag. It is 50' of URSA Aircord Pro dyneema which can hold up to an absurd 1,400 pounds! It's light and strong...and completely overkill. I purchased it when I didn't want to bring along the heavier 550 paracord and probably should switch it out for something even more practical (and light). My problem with the 550 paracord is the weight and the fact that it is susceptible to water retention (the dyneema cord is coated with urethane). Yet oddly enough, I think it is more useful overall. Being able to cut it open and have access to several strands of thinner cord is invaluable in a legitimate survival situation for snares, lashing, fishing line, bow, guylines, medical brace, and numerous other things which is one of the reasons I really want to carry it...yet I just can't make the mental leap to put it in my pack. Sure you could make cordage out of of braided saplings, vines, reeds, and all kinds of things nature provides...but the time and energy it would take to make something like that and the likelihood for it to be immediately functional isn't something I'll willing to roll the dice on when faced with a real survival situation. Well, a handful of survival merchandisers have taken an old idea and made it mainstream. 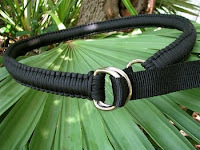 They have fashioned 550 paracord into belts and bracelets which can be unraveled as needed in a pinch. Bracelets offer around 24' of cord and belts around 125'. In fact, many manufacturers will actually give you a new one for free if you ever need it in an emergency, a marketing ploy that would require you to tell them your story so they could entice other potential buyers which your periling ordeal. Having this as a dual-use item, especially one not actually carried "in" the pack, may be a solution for a lightweight backpacker especially if it replaces a piece of gear you're going to be carrying anyway without any appreciable downside. My point is that if you're someone like me who refuses to carry something like 550 paracord in your pack because of one reason or another....but you still want to figure out a way to have the flexibility it offers, perhaps you could use something like a 550 paracord belt or bracelet as a dual use item to justify it. That's not to say I'll be on the cutting edge of paracord fashion in the wilderness this season, but I am putting it in the "maybe" pile. Over the course of the month of August, the acknowledged readership of my blog passed the 100 mark. These readers are from around the world and bring with them a vast amount of knowledge and experience which have been welcomed. What started nearly 2 years ago has spiraled to a point that I couldn't ever have imagined. I've made numerous friends, learned a lot, and reaffirmed my belief that the backpacking community is one of the most giving and selfless groups I've ever encountered. Although I have no delusions that my blog is little but the smallest blip on the radar of the lightweight backpacking cyberspace community, I wanted to express my appreciation to all those who spent any amount of time reading my ramblings and particpating in the community we all enjoy. For anything you have gained personally, I have gained more. It was through my initial research on blogs like this which drew me into the lightweight backpacking community. I proudly represent blogs dedicated to this subject and the cottage manufacturers which support these interests to the right of my blog -------> which I too continue to learn from. I am particularly proud of the fact that readers found my blog singularly through a grassroots effort, search engines, and word-of-mouth as I did my best to avoid advertising my blog elsewhere because I felt it was a bit cheesy and narcissistic to try to draw people in by using the foundation of established websites merely for personal gain. Unfortunately, the tactics of self-advertisement in this setting have become more the norm and organically grown readership is frequently replaced with tacky in-your-face hijacking of your favorite websites and blogs. I think part of respecting this industry as a whole can be shown through exercise of tact which often means operating under the belief that if something said deserves attention, people will find you. This perhaps isn't a success-model for a fruitful business, but this isn't a business and readership is voluntary. Looking back at my first post http://jolly-green-giant.blogspot.com/2008/09/welcome-to-my-blog.html, which also tells readers about me personally and helps explain the focus of my blog, I think I've stuck to the original goals I set out for myself. I can't say how long my blog will continue, but for now I will keep blabbering and I'd like to thank everyone for continuing to read and participate. It is through this collaboration that we all gain the knowledge, experience, and skills to help us have the most fun in the safest most dynamic manner. As for me, I'll be returning to the woods for some backpacking on the Appalachian Trail for the remainder of the week. Hopefully you too can escape. If not, find happiness in one of the many wonderful blogs and resources which exist that I too use to peak and maintain my interests while otherwise trapped in the giant gerbil ball of life. 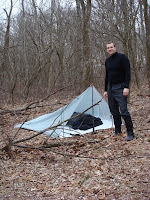 www.mountainfitter.com has recently joined the lightweight and ultralight backpacking scene with several cuben products. Instead of copying the designs of others, the owner (thankfully) thinks out of the box and doesn't rush to market with anything but well thought out products. For example, MountainFitter was one of the first to pursue a cuben hammock which was tested with the intent of going to market for the masses. After some testing, it was determined that the weight of the cuben fiber wasn't durable enough and the project was abandoned because the heavier cuben fiber needed was already equilavent to existing products (Grand Truck Nano 7). Rushing junk to market helps no one. I've mentioned MountainFitter in the past because I found their cuben products to be much more reasonably priced than other manufacturers. I also like the bonding method used as it doesn't puncture the fabric like stitching. If you haven't checked out their large stuff sacks and waterproof sacks, both made of cuben, take a look....when they are in stock. MountainFitter has another great product on their hands which is a soon-to-be-released cuben duo mid. MountainFitter is bringing to market a 108"x54" 8.5 oz version which reminds me of my old GoLite ShangriLa 2. I figure this product will be quite desirable to those who aren't quite comfortable with a tarp and want 4 walls while accepting the limitations of a floorless shelter. Unfortunately, with trekking poles, this product likely won't make it into my gear closet because I'm guessing the length just isn't long enough and I'd ultimately kick out the trekking poles while trying to sleep like I've done with every other shelter of similar design. However, for those of you who aren't too big for the modern world, this may be an excellent option for you. For most of the year, I've been quite content in my belief that the lightweight outdoor industry had slowed in sense of product development. A cuben Haven or Vamp by Six Moon Designs never came out nor did a similar shelter from Gossamer Gear - both of which I figured would be out by now (although I believe we'll see them by next year at the latest). Even products which were debuted at other earlier shows this year, such as the Ridgerest Solar which I mentioned in another entry, still hasn't made it to the consumer market. Terra Nova is coming out with a cuben version of their Laser 1 making it officially the lightest double-walled tent on the market which will come in at just over a pound. 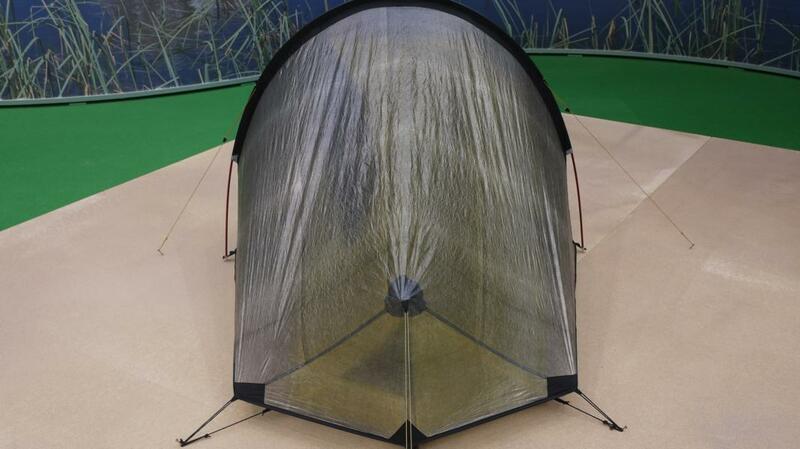 Sea-to-Summit is coming out with a tent that is very similar in appearance to SMD's Vamp and/or Haven...which to be fair, is a very similar design to other tents too. With tents, it is tough to reinvent the wheel. The Specialist, coming in both a solo and duo version, is a silnylon tent that will come in at 22 and 29.8oz respectively. 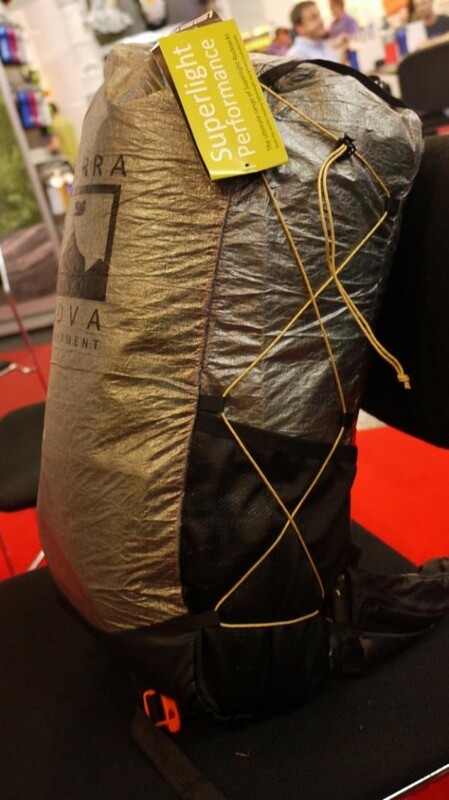 Terra Nova is also working cuben into their pack line with their Ultra 20 100g pack. 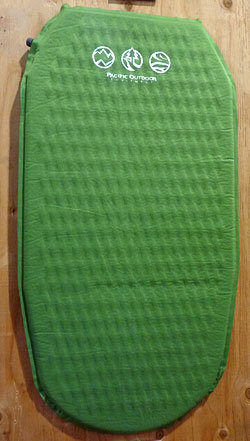 Probably one of my favorite products is the new Pacific Outdoor Equipment Peak AC inflatable pad. 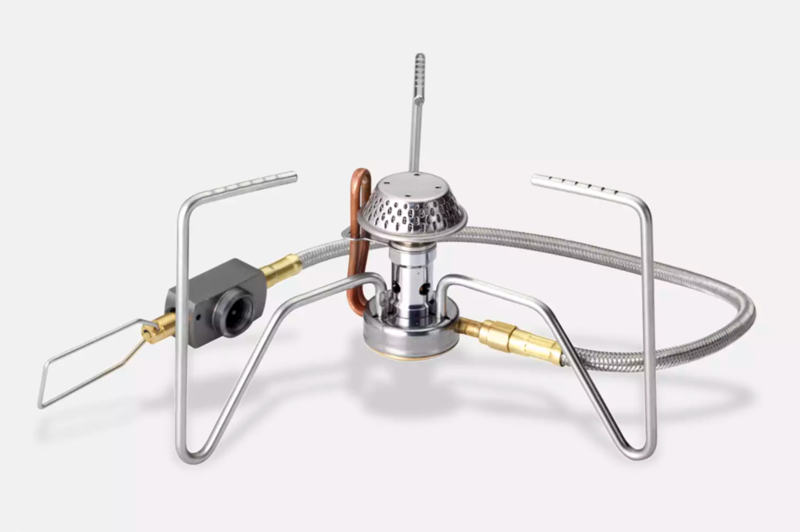 It should compete quite well with the NeoAir which has both detractors and followers. The Peak AC, like the NeoAir, uses a radiant barrier to increase the r-value and will start at $65 for a 10.75oz version. I also like the Pacific Outdoor Equipment Peak Oyl Lite sleeping pad which boasts a 3-4 r-value and will no doubt compete with the BPL Torsolite which I found to be laughably small...although the Peak Oyl is only 37"x18" for 9oz. For those of you who like to carry a more substantial knife than just a Swiss Army mini or a razor blade, check out the Baladeo knife which comes in at just 1.19oz for a knife with 4+ inches of blade. I should mention that I personally wouldn't carry this knife principally because it seems a little too frill-less to me (dangerous) and I also think the locking mechanism isn't as robust as it could be, but it may very well be a good option for some of you. Personally, for a lock blade, I like the Benchmade 530 at just 1.8oz. Sand Socks Inc. is coming out with "Grip Socks" which is a product for folks that want some basic footwear whether for camp or water. 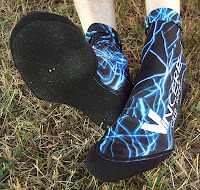 It is literally nothing more than a neoprine sock with some foam at the bottom. A pair of mediums weigh 3.3oz. 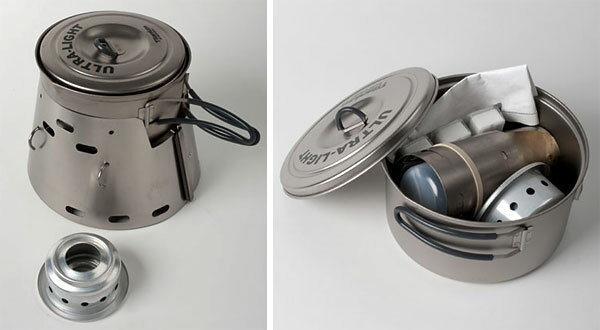 Trail Designs has listened to their customers and redesigned their wonderful Ti-Tri system into a cone that fits into a 1.3l, 900ml, and 600ml pot which makes packing a lot easier. Hopefully Titanium Goat will follow suit. There are a lot of other unique and interesting things on the horizon to include quite a bit of new clothing (ultralight down and rain options) and even new sleeping pads such as the redesigned NeoAir and superminimal pad called the Inertia X-Frame by Klymet which claims a weight of around 9 oz , but I just wanted to identify a few things that I found interesting. Hopefully we'll see some of these innovations by early spring if not sooner.